Thank you very much for building our new house within our limited time!! We really appreciate you've done everything so quickly for us and built a lovely house with great ideas. We love the study nook, windows above the kitchen bench and the ceiling at the living areas, still a lot of work to do (fencing, pool landscaping etc) but it will be a lovely home. Thank you very much for building our new house! We're really happy with the house colour. Thank you for being so patient while we choose colours! Also very happy you got rid of the pillar in the middle of the patio! We could not thank you enough for our amazing first home. We could not be happier with the process of the build, the communication and the end result of our home. I wish to express a BIG BIG thank you for the beautiful home you have built for me. The quality of the finish is superb, built exactly to plan and on time and most importantly, on budget. I cannot be more contented nor cannot ask for more! When pondering whether to buy Lot 576, I contacted several builders listed on Bluewater’s website to see what can be done with its irregular shape and my limited budget. Most replied with many concerns and I could feel some hesitation on their part on taking on my project unless the budget is drastically increased. 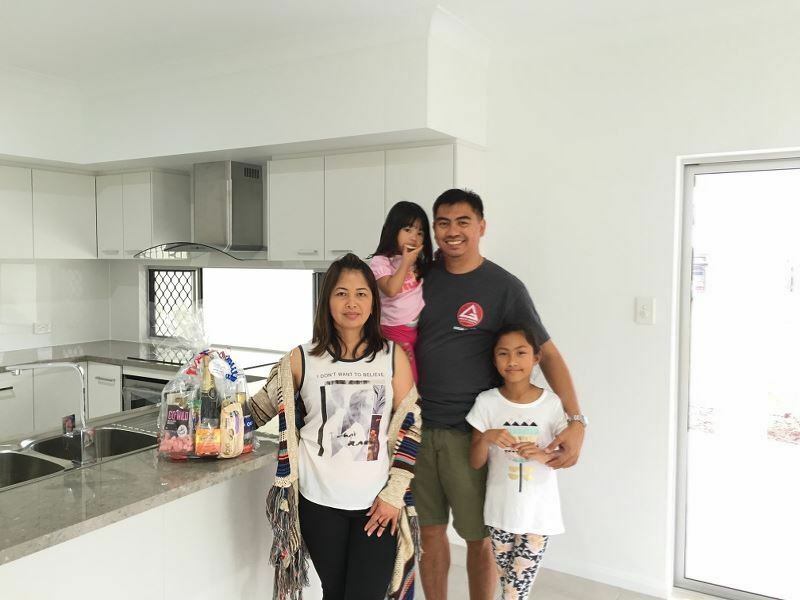 But Charmaine’s “can do” attitude and positive reply was the answer I was waiting for and although late at the starting line, Austart Homes surged ahead of the pack and never looked back. Trust is also important specially when you’re building 2,400 kms away and I immediately felt comfortable with Charmaine on the first email, and also with Ruth when the construction began. I will not think twice should I build another house in FNQ. So thanks again guys and well done! I would definitely recommend AustartHomes to anyone wanting to build in Cairns. Thank you Austart Homes for building another high quality home for us. 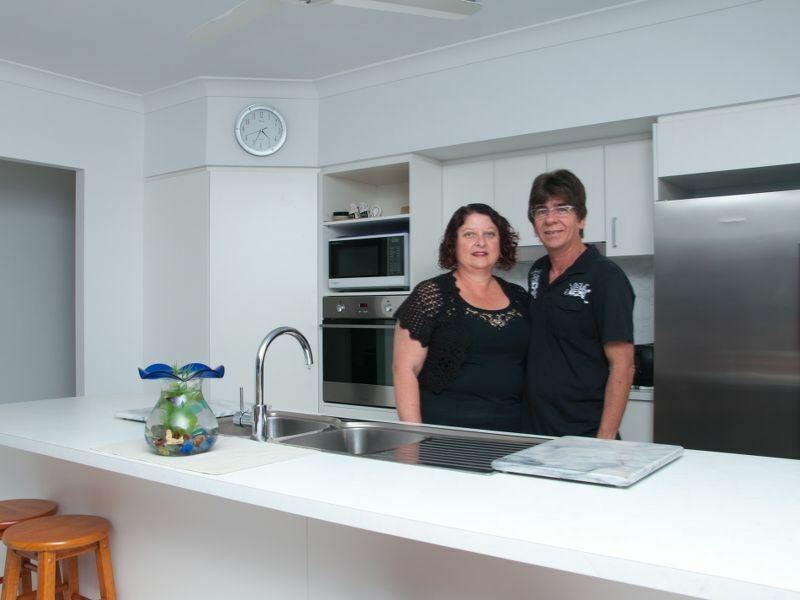 When we decided to build an investment property we knew we wanted to build again with Charmaine & Phill. The level of service we have received from Austart Homes in both our building experiences has been exceptional. Charmaine & Ruth are an amazing duo and have always gone above and beyond to ensure everything was done on time and done well! I loved choosing the design of the house – there are so many layouts to choose from & the selection of finishes is great too. The quality of the workmanship in both homes we built with Austart Homes has been excellent & we highly recommend Austart Homes to anyone wanting a fantastic home, whether to live in or as an investment property. Where do we start! This is our 3rd Austart home and once again you’ve come through with shining colours. We have been extremely happy with your customer service especially Ruth’s updates – thanks again Ruth. We cannot fault the efficiency with responding to our email requests with having matters attended to – thank you to Charmaine and Ruth. Now to talk about value for money. 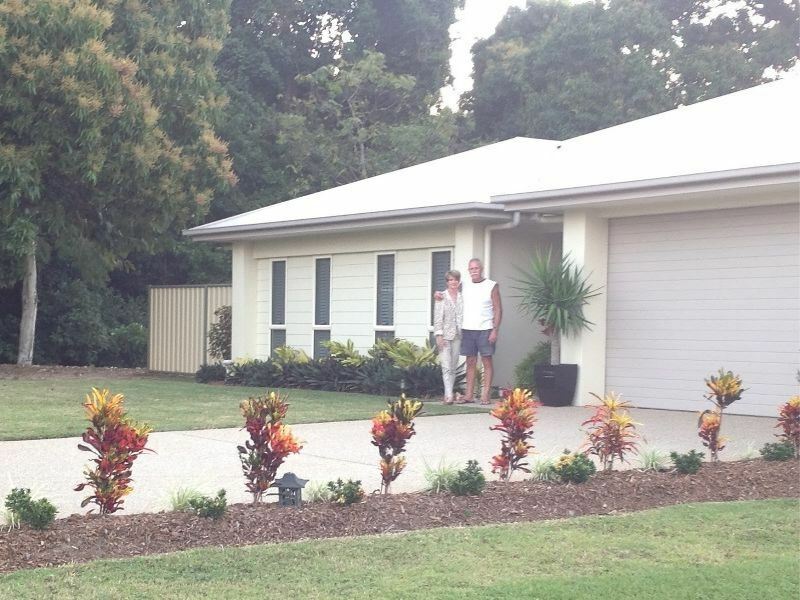 The home you have presented to us is of top quality and you cannot get this from any other builder in Cairns! We would truly recommend Austart Homes to anyone thinking of building a new home. You won’t need luck as it comes with the home! Thank you so much for the personalised and very professional service you have provided throughout our build. You are always so lovely to talk to and I appreciate all the updates you give us. You are a credit to Austart, keep up the Amazing work. We would like to thank you for providing us with excellent customer service. You make the build process stress free and we recommend you guys to everyone. We look forward to our investment property being completed in a few months and know the quality will be as excellent as our first home you built for us. PS Your new show home is stunning! Hi Ruth and Charmaine Just a quick email to say thank you for the professional service from austart through out the building of our house. We are so happy with it . Thanks Leigh By email on the 28/10/2014"
Dear Charmaine and the Austart Homes Team, Its been an incredible and worth while journey. Thank you so much for building my home... and doing it well before the contemplated date for practical completion. And did I mention the cash back offer.... That was the icing on the cake for a first time invester like myself. Thank you again and God Bless your business. All the best for the future. Rue, July 2014"
Dear Charmaine, Phil, and Team, The decision to build a house is obviously a big step, you and your staff helped us at every stage of the build. You were never more than a telephone call or an email away. We would like to thank you all, including the well-organised office staff and your very skilled and helpful tradies. We are over the moon with the completed product. The house, an Elite 253, was completed before time and the build was trouble free; the finish is exceptional, providing us with everything we asked and wished for. Phil runs a tight ship and takes pride in his work, ensuring at every stage that the quality of the tradies work was up to a very high standard. The Tradies, from the laying of the slab to final completion were professional and took pride their work. Charmaine had a no nonsense approach, her knowledge and skill in interior design is creative, innovated, and nothing was too much trouble, this has lead to our new house feel like a home. Everyone who has visited the house has commented on how well everything is finished and how the design flows, there was certainly a wide range of designs available to choose from. I would highly recommend Austart Homes to anyone who is thinking of building a home. 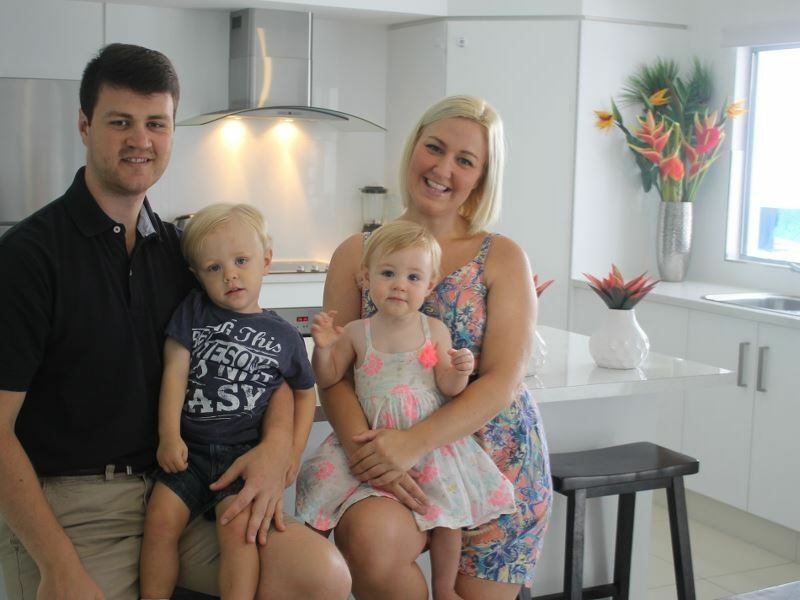 Kindest Regards Neil and Jenny, 9/6/14"
""After holidaying regularly in Cairns for many years and purchasing our block of land approximately 12 years ago, we started looking at new display homes in the Cairns area on each trip. We looked at all displays available but always came back to Austart Homes as a front runner in our selection. Although we thought the display was too large for two people, Austart were able to provide a design which kept all the features we were looking for in our new home but on a smaller scale that met our needs and budget. During the building process, Austart staff were extremely helpful, professional and kept us regularly updated and informed of developments regarding our building. Our home was completed one month early and we are now residing in our new home which we just love. " I hope this email finds both you and Phil well. I just wanted to let you know that Peter and I went to your new display home today, The Hamilton, at Smithfield Village. The front certainly did not do justice to the beautiful home that was behind those front doors. It is absolutely amazing and we just loved it. So very well thought out and that kitchen and living area was awesome. I am not sure whether you have been past recently but our fences have gone up and we keep getting such positive feedback from people. Everybody in Cairns knows this house!! It is such good advertising for you. We have literally had people stop when we were out the front in the garden telling us what an amazing job we have done which makes us very proud. Feel free to call in any time so you can look for yourself. We are currently landscaping the backyard and Peter is going to be doing some paving.